The Righteous God tests the Hearts and the most secret part of man. “The Lord is righteous, for I rebelled against His mouth. Hear now, all peoples, and behold my sorrow, My virgins and my young men have gone into captivity.” Lamentations 1:18. Righteous, tsaddiq; Strong’s #6662: One who is right, just, clear, clean, righteous, honest; a person who is characterized by fairness, integrity, and justice in dealings. The Lord is righteous in all His ways, and holy in all His works (ps.145:17). God Himself is the standard of ethics and morality; it is part of His very nature and will. A good example of tsaddiq is an ordinary person who is honest with other people (prov. 29:7) and obedient to the laws of God (Gen. 6:9;Ps.5:12). It is the tsaddiq who shall live by his faith, in Hab. 2:4. However, even a just man is not sinless (Eccl.7:20). 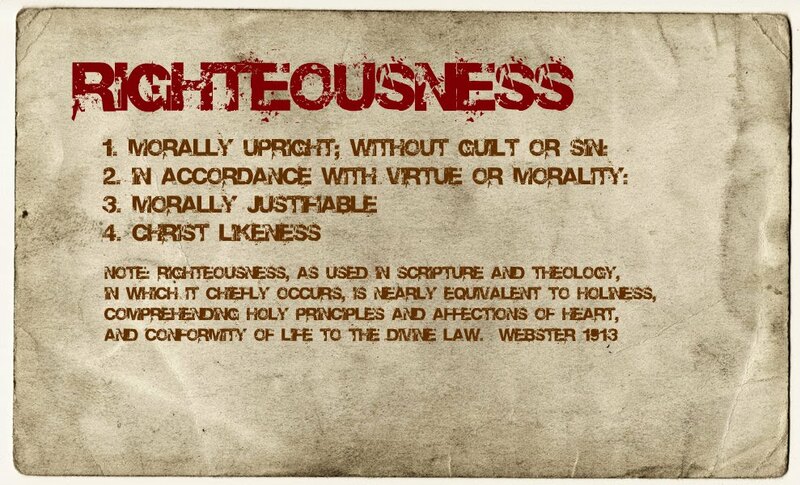 We should never become self-righteous (Eccl.7:16). Wow. I haven’t been getting notifications of your blog posts. I will try and get caught up with reading them tomorrow, and I’m going back to my blog now to make sure I’m notified when you post something. We’ve got a storm coming in and I’ve prayed that God will protect our state. The radar doesn’t look good at the moment. I’m praying that no damage will be done and that I’ll be able to get back to your blog tomorrow to catch up. I’ve also checked the box here so that I will be notified by email when you post something. It seems that WordPress has quite a few burps. Sometimes I have to redo posts that get all kinds of crazy text and drop letters in a sentence. Weird goings on.I hope it clears up. I pray your weather is milder and does no damage. Blessings to you and family. Thank you for your prayers Manny, and for your kind words. I am now getting notifications of your blog posts again. Yea!!! And, PRAISE THE LORD, the bad weather vanished for the most part. Could it be because of the righteous, “Right to Life” laws that were recently passed by our state legislature? Some would scoff at the idea, but I think it may be the very reason. Our state has had some bad weather, but nothing compared to other places throughout the country. Yes, I could see the liar working his disgust out on your state. I am not all in the camp of Pat Robertson but years ago he asked Christians to pray against a hurricane headed for Chesapeake Bay and few hours later the hurricane turned and never hit land.